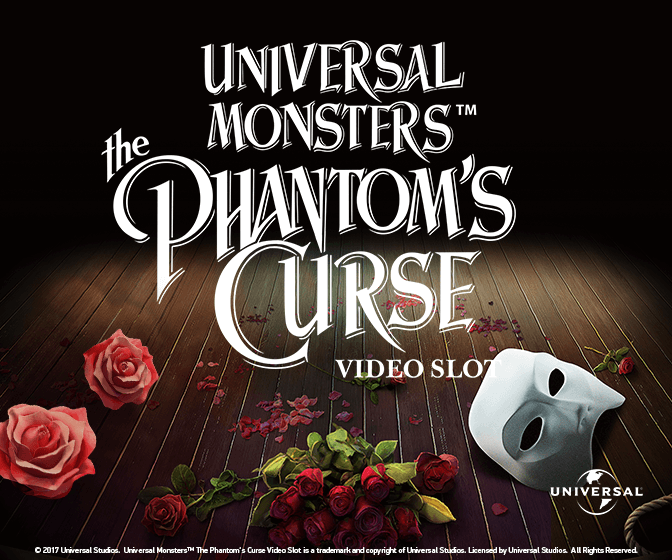 The Phantom’s Curse™ is an online slot by Netent that was first scheduled to see the light as a branded slot: “The Phantom of the Opera”. It was initially set for a July 2017 release. That was until Netent ran into some licensing problems that prohibited them from using the name Phantom of The Opera. Netent has got quite some experience (and success!) in releasing slots based on scary Universal Studios movies. Prior releases include The Invisible Man™, Creature From the Black Lagoon™ and Dracula™ video slots, all of which were very enjoyable. Visually, The Phantom’s Curse™ looks stunning. When you open the slot, you are treated to a good old-fashioned Netent intro movie, and there are flashes of the heartbreaking love story interspersed with the gameplay. On top of that, this slot is filled to the brim with exciting features, respins and extra wilds. A great premise for one of the biggest slots releases of 2018. Was it all worth the wait? You bet it was! In the background, we see the famous Parisian Opera House, where the deformed Phantom has created his own dream world. He is believed to be a ghost for a long time until his endless love for the singer Christine forces him to come out of the shadows and into the light. The graphics of this slot are outstanding, with sharp colours, beautiful symbols and lots of animations. The soundtrack is bombastic and heavy, just as it should be for such a fantastic tale of love, loss and happiness. And singing. The Phantom’s Curse™ is a 5 reel, 40 fixed pay line slot. Winning combinations pay out both ways. The minimum bet is 20p, and the maximum bet is capped at 200 pounds per spin. Christine and the Phantom himself are the premium symbols in the game. Medium paying symbols are the knife, the yellow rose, a ring and a pearl. The low paying symbols are the card symbols hearts, clubs, diamonds and spades. Payouts for a 5-of-a-kind are between 20 and 200 coins. All symbols are stacked, and there are several wild symbols active in the game. The maximum payout per spin is 4,000 coins. As with nearly all Netent slots, The Phantom’s Curse offers players a high Return to Player: an average of 96.57% of all bets is paid back to the player. The variance of this slot is medium. These two factors combined make The Phantom’s Curse a very suitable slot to grind through those pesky bonus wagering requirements. In true Netent style, this release comes with lots of bonus features. The free spins bonus comes with an unlimited amount of spins. Beware, though, when Phantom Wilds appear on the screen, the ropes of the big Chandelier will be cut through. When all ropes have been severed, the chandelier comes crashing down, ending the free spins bonus. When you win the Pick and Click bonus, you are awarded cash prizes. Select a mirror at the end of the bonus for an extra multiplier. The Phantom Respin is an exciting feature where the player is awarded free respin with sticky wilds. With a little luck, this can boost your winnings. The Phantom’s Curse™ is a wonderful release by Netent that has been well worth the wait. Even if you are not a big fan of musicals – or the opera – you will enjoy this online slot, there is just so much going on at all times. In the sound and graphics department, this slot is also excellent, with beautifully designed symbols, superb animations and a movie-like soundtrack. You can enjoy this video slot on both your desktop, mobile device, tablet or laptop. Play The Phantom’s Curse™ at Casino Heroes with a 100% bonus up to £50 or up to 375 extra spins. Term and conditions apply. A deposit is needed to receive a bonus.